“….A large centrepiece comprising plastic flotsam collected from the beach cleaning operations in the North Sea, Hawaii, the Baltic Sea and the rest of the world is displayed with the aim of arousing public awareness of plastic waste. …..Through the exhibition, visitors can gain an in-depth understanding of the chemical composition, classification and recycling processes of different plastic materials, and also learn about the harmful effects of plastic waste on birds and marine animals. The aim is to let us realise that we must curtail our consumption of plastic and encourage the recycling of plastic immediately. This is really weird! If there are no water fountains installed because drinking and eating are prohibited, why are there three vending machines installed? Two out of three machines sell plastic bottled water. But wait, there’s more. The very brand of bottled water sold in the vending machine was also used by the students in their “Project We Can” art project. I guess the purple bottle caps were irresistible. The students really didn’t have to go all the way to the beach to pick up these bottles, they could have just gotten them at the Science Museum. If you follow the financial markets, you’ll notice that the price of commodities such as oil have plummeted over the last couple years. Plastic is made of oil. As a consequence, the recycling business globally is in trouble. In Hong Kong, where there are no subsidies for recycling and with few exceptions, no charges for dumping waste into the landfill, recycling has ground to a near standstill. Most plastic bottles, even if placed in the recycling bin, will still end up in the landfill anyway. Not only the Science Museum, but all other museums managed by the LCSD have no water fountains. Ironically, while there is not a single water fountain or dispenser in any of these museums, there are numerous beverage vending machines. Premises which allow the installation of vending machines can share in the profits from the sales. We would like to ask the LCSD how many beverage vending machines have been installed on their premises, and if they collect profit-sharing? We give this exhibit by the Hong Kong Science Museum a Green Wash rating. 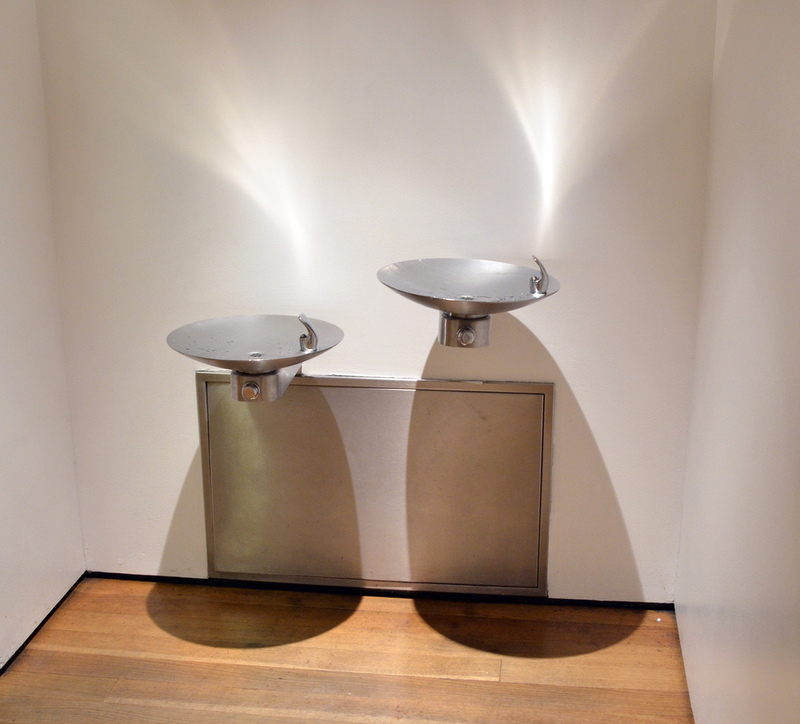 Drinking fountain at the Museum of Modern Art (MoMA) in New York. Thanks for highlighting this. The phrase “Prevention is better than cure” springs to mind. I wonder if the Science Musuem folks can see the irony in having the vending machines and the Garbage Exhibit in the same building.